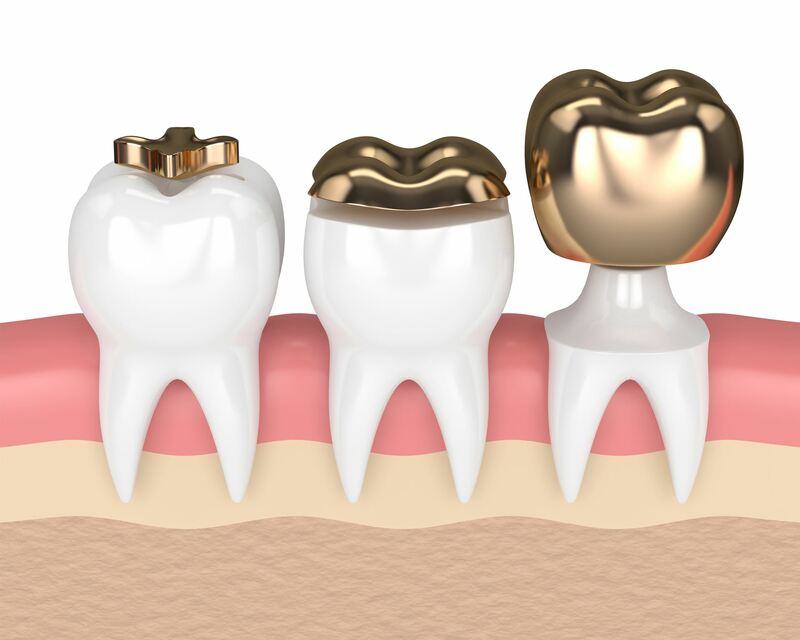 When a tooth has been moderately to extensively destroyed by decay, previous drilling, or fracture but there is still sufficient enamel remaining, one innovative way it can be restored is with a porcelain inlay or onlay. You can think of a dental inlay or onlay as being midway between a filling or a crown. Inlays or onlays are used when not enough tooth structure remains to support a filling, but the tooth is not so severely damaged that it needs a crown. 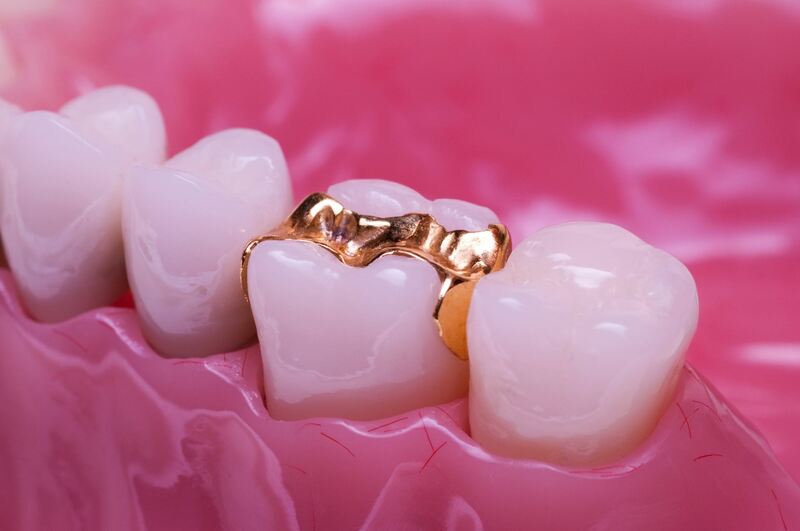 Inlays or onlays can be made of gold, composite resin (plastic) or ceramics. These are considered very conservative restorations. The porcelain allows an excellent esthetic result. It is attached to the tooth using a bonding procedure, allowing it to become very strong. It can be used with wonderful results in small, medium, and even large restorations lasting more than 12 years, relatively trouble-free. However, how long they last depends on the material used, the teeth involved, the forces of chewing and how well the patient maintains them with good oral hygiene and regular visits to a dentist. An inlay or onlay is one way to restore a damaged or decayed tooth. If more than half of the biting (occlusal) surface of a molar has decayed, your dentist may use an onlay rather than an inlay. Inlays and onlays can be direct (placed during a single dental visit) or indirect (made in the laboratory). There are two types of inlays and onlays: direct and indirect. Direct inlays and onlays are made in the dental office and can be completed in one visit. Indirect inlays and onlays are made in a laboratory and require two visits. Which type of inlay or onlay is used depends on how much sound tooth structure is remaining and whether there are any cosmetic concerns. We will remove the decay and shape the tooth to receive the inlay. We then will place a soft material (composite resin) and mold the composite to fit the tooth structure. The inlay is then removed and hardened in a special oven. The hardened inlay will be cemented or bonded to your tooth. After the inlay is cemented, it will be polished. We may have to shape it slightly to adjust your bite (the way your teeth come together). We will remove the decay, take an impression of the prepared tooth and neighboring teeth and put in a temporary filling. The impression will be sent to a laboratory, which will make the inlay or onlay. It usually takes 4 days for the inlay or onlay to be made. At your second visit, we will take out the temporary filling, clean the tooth and use cement or a bonding agent to place the inlay or onlay. After the inlay or onlay is cemented, it will be polished. We may have to shape it slightly to adjust your bite. Inlays and onlays require only regular oral hygiene, which includes brushing, flossing and regular visits to the dentist.